Few cigar companies have undergone as much change in recent years as Nat Sherman. Moving its flagship shop at an impressive new location, hiring flamboyant executive Michael Herklots, bringing new and unexpected cigar lines to market. All contributed to a new image for the New York-centric brand that had often come to be associated more with colorful high-end cigarettes than with premium cigars. The 1930 Collection, a six-vitola line introduced last year, is a big part of the maker. Using a Dominican wrapper and binder, with long-filler from Nicaragua and the Dominican Republic, it boasts a strength level—upper medium—beyond my image of most Nat Shermans. For this review, I received three Gran Robustos (5.25 x 54) from the company. The stick has an MSRP of $11. Each vitola in the 1930 line comes packaged 24 to a box, except for the Super Lancero (8 x 38), which is in boxes of 10. The Corojo wrapper makes quite a first impression with a rich and oily appearance. The cigars, rolled at Manuel Quesada’s Dominican factory, are rock hard to the touch but that is, fortunately, no indication of looming problems. Draw and construction are excellent. 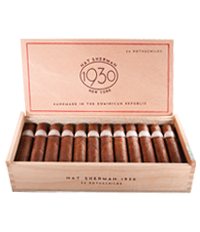 The 1930 offers a satisfying smoking experience, an enjoyable cigar that should appeal to nearly any enthusiast. It is not overly complex, though there is some shift in the second half when the spice ramps up a bit. Generally, though, the flavor profile is dark and rich, with leather, coffee beans, and spice. If the price seems a little steep, bear in mind that the Gran Robusto is quite a bit larger than your typical robusto. Other attractive attributes are tremendous smoke production throughout and a slow, cool burn that results in a lengthy smoke. I suggest you give the 1930 Collection a try, especially if it has been a while since you smoked a Nat Sherman. It will hold up as an after-dinner cigar or enliven an afternoon. I rate this cigar four stogies out of five. They also pair very well with Widow Jane Bourbon!